Try out this classic pub snack recipe with an extra twist of flavour and save time and money in you pub with COLMAN'S Sage and Onion Stuffing Mix. Mix the sausage meat, COLMAN'S Sage & Onion Stuffing Mix and pickle together. Cut the pastry in half lengthways. Brush one edge of the pastry with egg wash.
Place the sausage meat mix along the middle of the pastry then fold over and press to seal. Brush the top with the remaining egg wash then sprinkle with the black pepper. Place into the fridge and chill for 20 min. 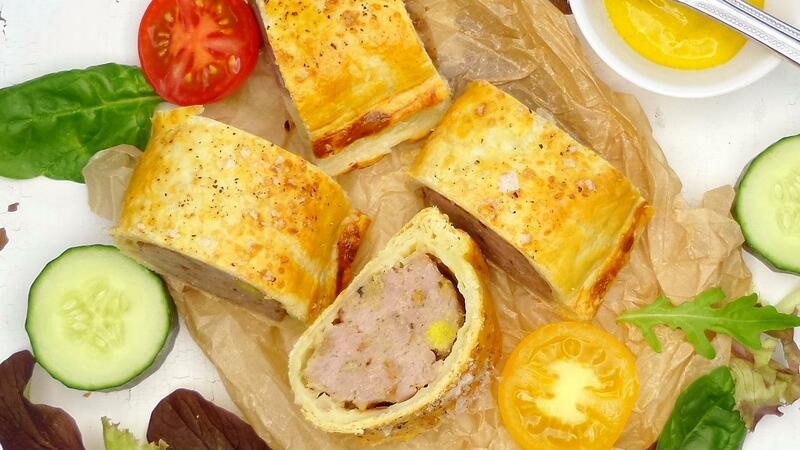 Place the sausage roll onto a roasting tray. Bake for 18-20 min. or until cooked through and golden. Remove from the oven and allow to cool slightly before cutting into smaller portions. Place onto a serving plate.